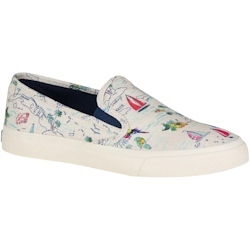 Head to seaside or high street in the Sperry Women's Seaside Breton Map Print, a lightweight, laceless sneaker with elastic panels for easy on/off and a secure fit. A no-slip rubber outsole with Wave-Siping™ is securely bonded to upper for durability and stability, while a soft footbed with arch support provides all-day comfort. Made in a striped canvas, this seasonal favorite is purpose-built with versatile style.